WekaIO has served up 95 per cent of the Summit supercomputer's 40 storage racks IO using just half a rack's worth of its Matrix scale-out fast filer software. 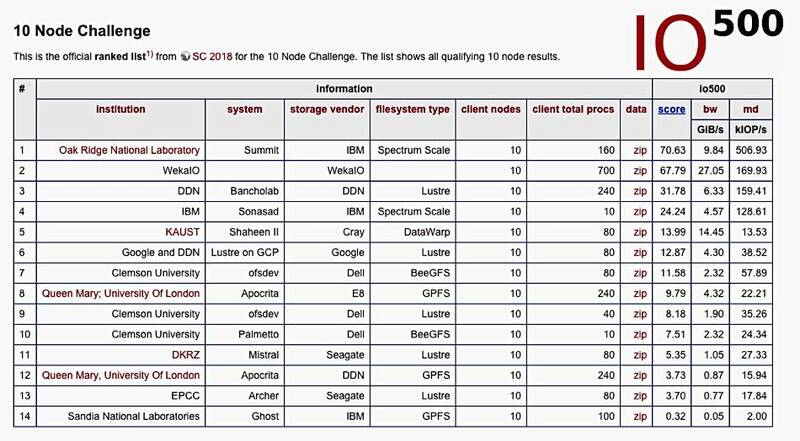 It's documented in the IO-500 10 Node Challenge List, maintained by the Virtual Institute for I/O. WekaIO ran the IO-500 test on eight Supermicro BigTwin enclosures, representing less than half of a storage server rack, and scored 67.79, coming within 5 per cent of the Oak Ridge IBM Summit Supercomputer, which ran its system on a 40-rack Spectrum Scale storage cluster. The IO-500 is a list comparing storage systems that work with the world's largest supercomputers. Each system is evaluated by the IO-500 benchmark that measures the storage performance using read/write bandwidth for large files and read/write/listing performance for small files. Supermicro's BigTwin is an x86 air-cooled 2U multi-node system supporting 205-watt processors, 24 DIMMs, and hot-swap NVMe flash storage with Mellanox networking. WekaIO scored 67.79, compared to Summit's 70.63 from its Spectrum Scale software. Third place in the list went to DDN, using the Lustre parallel access filesystem, with a score of 31.78, less than half WekaIO's. The 10 nodes are client nodes by the way. The Matrix filer software is POSIX compliant, and claimed to run more efficiently than NFS, using a customised protocol to deliver file-based semantics.